The frequent problems encountered by some new customers on the laser die board cutting machine, bought a laser die board cutting machine, they will not use AUTO-CAD drawing, and the drawing master is not only very high salary requirements, but also not easy to recruit, laser die board cutting machine Is it a decoration? In fact, most of the drawing of laser die board cutting machine only uses CAD's two-dimensional, easy to learn, and people are better than others. Here we briefly introduce how to quickly learn the CAD drawing of the laser die board cutting machine, allowing you to easily use the laser die board cutting machine. 1. Be familiar with some of the common commands used in laser die cutter, and fully understand the usage of each parameter. There are CAD textbooks available on the market. 2. 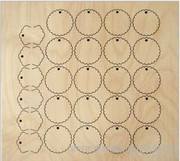 Learn textbooks step-by-step learning, repeated multi-thinking multi-operation laser die cutter. 3. Proficiency in the use of laser die cutter. 4. Grasp the shortcut keys of the commonly used commands of the laser die cutter (below), which is very helpful for the speed improvement of the drawing. 5. The multi-combined drawing method of the manual knife mold is familiar with the laser die cutting machine. 6. Practice is correct, more practice and more drawing, in order to master the use of laser die cutting machine. Some of the other shortcuts and labels for the laser die cutting machine are not written here. If the self-study of the laser die cutting machine is not so smooth, we can use the laser die cutting machine to guide the CAD drawing.